Robert Panitch, also known as "Uncle Krunk" on the tournament circuit, passed away on May 1 at the age of 63. Panitch, a familiar face on the World Series of Poker Circuit, World Poker Tour, and at various Borgata events in Atlantic City, died in his sleep from what is believed to be a heart attack. Born January 12, 1952, in Chicago, Panitch continued to live in the area for most of his life. According to an obituary published in a Chicago Tribune Media Group publication, Panitch was the "beloved son of the late Milton and the late Mamie Panitch, treasured brother of Alvin Panitch, Joyce Berman, Nancy Panitch, and Richard Panitch, and caring uncle to many loving nephews and nieces." "He was, in every sense of the term, 'his own person,'" his brother, Richard Panitch, told PokerNews. "No one would ever accuse him of following the crowd. He was an accomplished amateur chef who 'went organic' long before it became fashionable. Although he had no children of his own, Bob loved his family. He was a 'favorite uncle' of numerous nephews and nieces. The "favorite uncle" moniker seemed to carry over to the poker world as Panitch quickly ingratiated himself to the young circuit regulars, who subsequently dubbed him "Uncle Krunk." "Bob loved the poker tour," explained Richard Panitch. "He came to it rather late in his life, but it meant the world to him. For many, many years, he was the sole caretaker of our elderly mother. After she passed away almost four years ago, he began playing in tournaments inn earnest. He drove to most of the tournaments by himself. He loved the camaraderie and friendships that he formed. He truly enjoyed the intellectual challenges and excitement that the poker tournaments provided." Panitch amassed $469,362 in career tournament earnings, with $137,283 of that coming in March 2014 when he won the WSOP Circuit St. Louis Main Event. That marked his second WSOP Circuit gold ring after winning a $365 No-Limit Hold'em Turbo at Caesars Palace in Las Vegas a year earlier. However, Panitch's biggest score, and arguably biggest accomplishment, came in May 2013 when he finished third in the WSOP Southern Comfort 100 National Championship for $156,743. Panitch was prominently featured on the television broadcast of that event. "Bob was a tremendously caring person," Richard Panitch continued. "Countless times he would perform favors or bestow little gifts without ever seeking or wanting something in return. He was 'the caretaker; of the family. If someone was sick or hospitalized, before very long, Bob would be at their home or hospital room with an elaborate home cooked meal. Bob was an adventurer. He did a great deal of traveling in his life, but he always found his way back to his family." Panitch's family will honor his desire to be cremated. "His family celebrated his life, and we will continue to do so forever," Richard concluded. 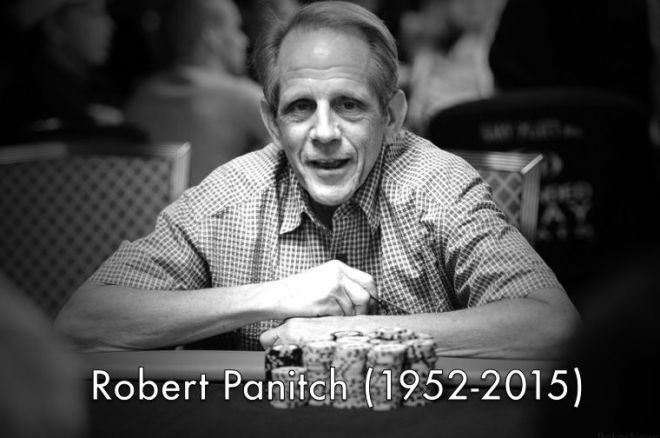 PokerNews joins the rest of the poker community in passing their condolences to the Panitch family.